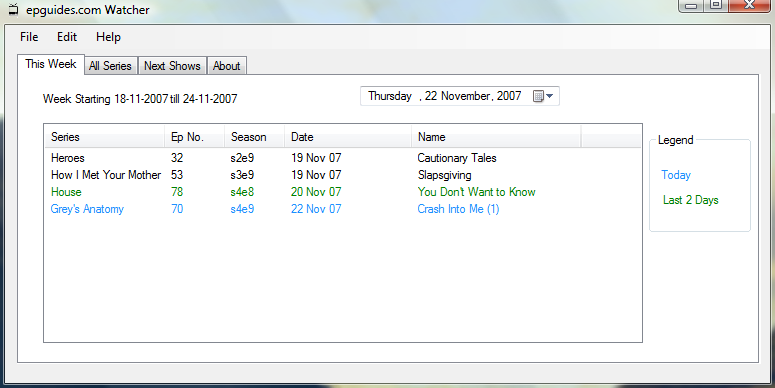 Epguides.com watcher is a simple tool to monitor/track out which tv episodes are coming out. It will download the webpage from epguides.com and check the air dates and times of your favorite tv shows. TV shows are customizable so one can add his own like: Family Guy, Smallville, 24, Lost, One Tree Hill, Grey's Anatomy, The Simpsons, Desperate Housewives, House MD and well all TV shows listed on epguides.com (which basically lists all current and old tv shows). And finally a faster way to add a lot of series, maybe by loading http://epguides.com/menu/current.shtml and presenting a list with tick boxes.